Yoneda Sake Brewery was founded in 1896 by Kingoro Yoneda, and it still stands in that location in Matsue City’s Higashi-hon-machi. 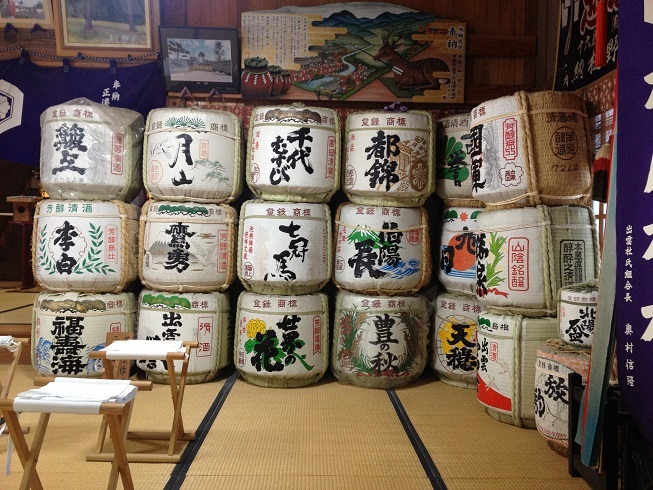 We here at Yoneda Sake Brewery are deeply committed to providing our customers with the best sake possible. Our ideal sake is one that, as it touches your tongue, first provides you with a delicate sweetness which expands to the rich flavor and full aroma of our sake as you enjoy a full sip, then leaves you with a refreshing aftertaste. Simply put, our sake brings out the natural flavor of the rice used to brew it. Just what is “local sake?” It is sake that uses ingredients produced in the area where it is being brewed. At Yoneda Sake Brewery, we use as much locally grown rice as possible, as well as delicious local spring water, and all of our products are brewed by head brewers from around Shimane. More than 80% of the rice we use for brewing sake is grown right here in Shimane Prefecture. In particular, our Pure Rice Premium Brew “All Matsue” is brewed using only organically fertilized rice grown by local contracted farmers. We use naturally occurring spring water from a soft water spring that we found on a mountain near the Tamatsukuri Hot Springs area west of central Matsue after an extensive search. Soft water is best suited to sake brewing, and this spring helps us make delicious sake for you, the customer.